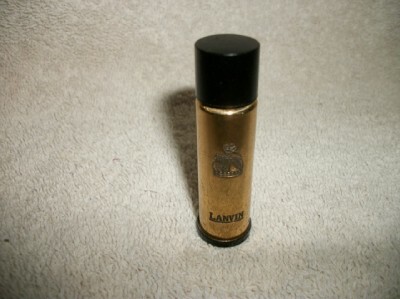 Arpege vintage perfum bottle by lanvin in very nice condition. measures 2 1/2 inches tall. Empty refillable bottle as pictured. *we reserve the right to change shippers on free shipping items due to changing rates and rules. *International buyers are responsible for customs charges in their country. We have no control over delays in Customs. PAYPAL IS ACCEPTED AS A PREFERRED PAYMENT. TRACKING IS ONLY AVAILABLE IF YOU CHOOSE PRIORITY MAIL INTERNATIONAL. THE POST OFFICE DOES NOT TRACK OR INSURE FIRST CLASS MAIL INTERNATIONAL. WE WILL USE PRIVATE INSURANCE IN THESE CASES WHENEVER POSSIBLE BUT NO TRACKING AVAILABLE. WE TRY TO DESCRIBE EVERYTHING TO THE BEST OF OUR ABILITY. IN THE EVENT WE ARE IN TOTAL ERROR WE WILL REFUND THE PURCHASE PRICE. EXCEPTIONS ARE ITEMS STATED AS IS OR ITEMS STATED NO RETURNS. WE ENCOURAGE EVERYONE TO ASK QUESTIONS. WE ARE PERSONAL COLLECTORS, TRADERS AND RESTORERS OF OLD TOYS. 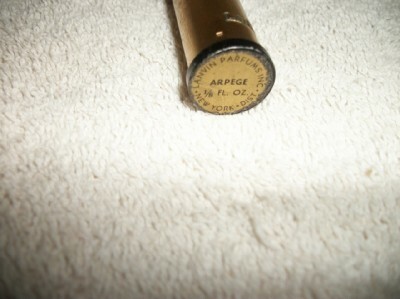 WE ALSO TRADE IN ALL KINDS OF ANTIQUES AND COLLECTIBLES AND ARE ALWAYS BUYING. WE HAVE BEEN DEALING FOR MANY YEARS. BUY WITH CONFIDENCE. WE TRY TO DESCRIBE EVERYTHING AS ACCURATE AS POSSIBLE. IN THE EVENT WE ARE IN ERROR, WE WILL GIVE CREDIT ON PURCHASE IF WE ARE NOTIFIED OF THE PROBLEM WITHIN 48 HOURS AND MERCHANDISE IS RETURNED AT BUYERS EXPENSE WITHIN SEVEN DAYS. WE DO NOT REFUND SHIPPING COSTS. NO RETURNS ON SO STATED ITEMS AND AS IS STATED ITEMS.